Nice Hotel close to the beach and restaurants. 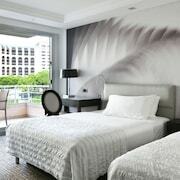 Excellent hotel Enjoyed a 4 night stay - room very comfortable, especially bed and bedlinen. Restaurants very good. Staff excellent - very professional. Location perfect. Would definitely stay again. Beautiful hotel This is a fabulous hotel, beautiful rooms, excellent food, we were upgraded to a sea view even though we had only booked a mountain view and it was stunning. I will definately go back here! Dated and lacking for a SLH I wouldn't recommend this hotel. Location is brilliant but hotel is dated and service not what you would expect. I definitely don't think it should be part of small luxury hotels of the world. Très bien placé Venu pour la rencontre ASM-OM, l’hôtel ce situe à deux pas du stade. Établissement de très bon standing. J’aurais apprécié que l’on me prévienne pour les travaux qui m’ont réveillé et qui ont durés toute la matinée. C’est le seul point négatif du séjour. 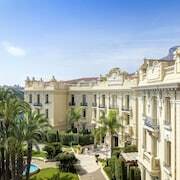 There are so many places to stay in Monaco that it can be tricky to whittle things down. 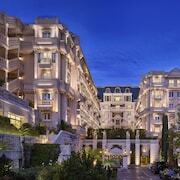 This is where ebookers comes in: we can show you the best hotels in Monaco in a matter of moments. You’ll be able to see all the hotels on a detailed map, so you can check how close they are to various landmarks. 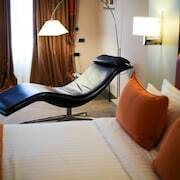 In fact, you can specifically search for hotels that are close to specific attractions, as well as filtering your search for lavish, high-end hotels or comfortable, cost-effective accommodation. Our informative hotel descriptions, which include photos of the various pads and details on rooms and amenities, will help you make the right decision for your getaway. 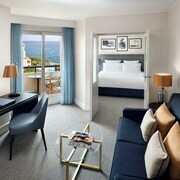 Whether you’re coming from near or far, you can make use of ebookers to organise your journey to your hotel in Monaco. Searching for flights to Monaco will instantly show which airlines and routes are available for your chosen travel schedule. You can then look up our car hire deals and arrange to have a vehicle waiting for you when you arrive, so you can go seamlessly from the airport to your hotel. Having your own wheels will also make it easy to travel around and visit more remote towns and villages, as well as rustic restaurants that might be out in the rural areas. You have a whole, exciting country to explore, after all. Let’s face it, one of the joys of being on holiday is doing as little as possible. Even just lounging around your hotel is an activity in itself. 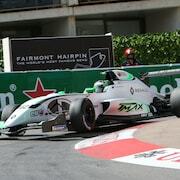 Of course, there’s so much to see in Monaco, and if you’d like some inspiration then check out our Things to Do tool. This will lay out the attractions and major sights around your Monaco hotel, so whether you’re just looking to wander and sightsee, or explore cultural attractions and places to take the whole family, ebookers will have you covered.